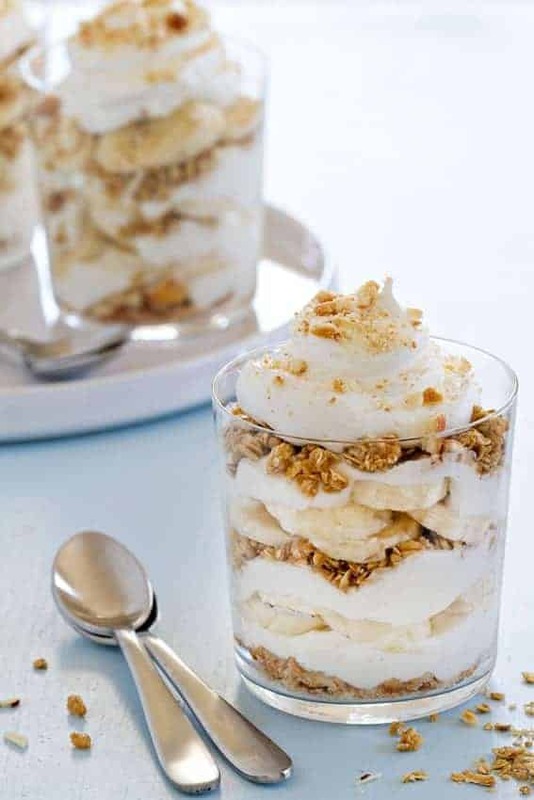 Banana Pudding Breakfast Parfaits are a sweet way to start your day! Made with vanilla yogurt, granola, and just a few vanilla wafer cookies, they make a fantastic addition to brunch. It’s finally warm enough to have brunch outside, you guys! Unfortunately, my yard is still a bit of a dust bowl, so we won’t be having any meals out there just yet. But now we live close enough to my parents and brother that we can invade their space instead to enjoy the beautiful weather and a beautiful breakfast together. Who knew things like sod cost so much? Not this girl, I’ll tell you that much. I’d much rather concentrate on things like making you scrumptious parfaits. 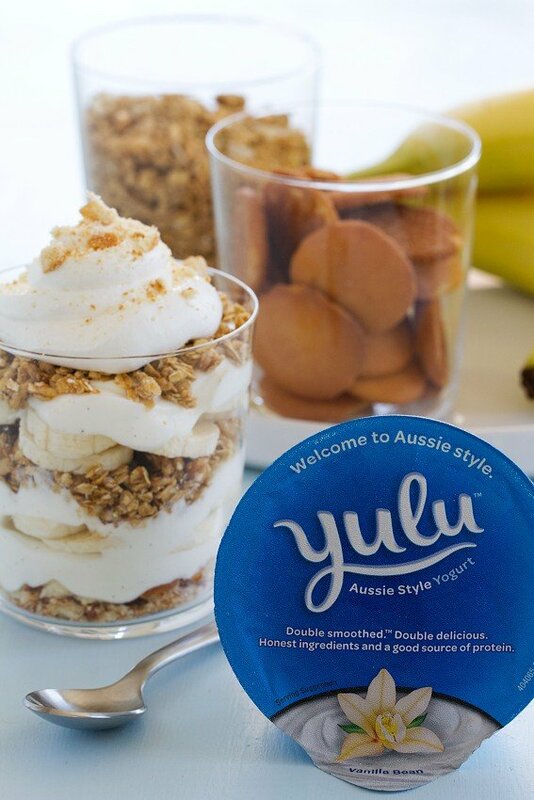 That’s right – Banana “Pudding” Breakfast Parfaits with the most lovely ingredients. These breakfast parfaits are a whole lot healthier though. Especially if you use a yogurt that is high is protein. 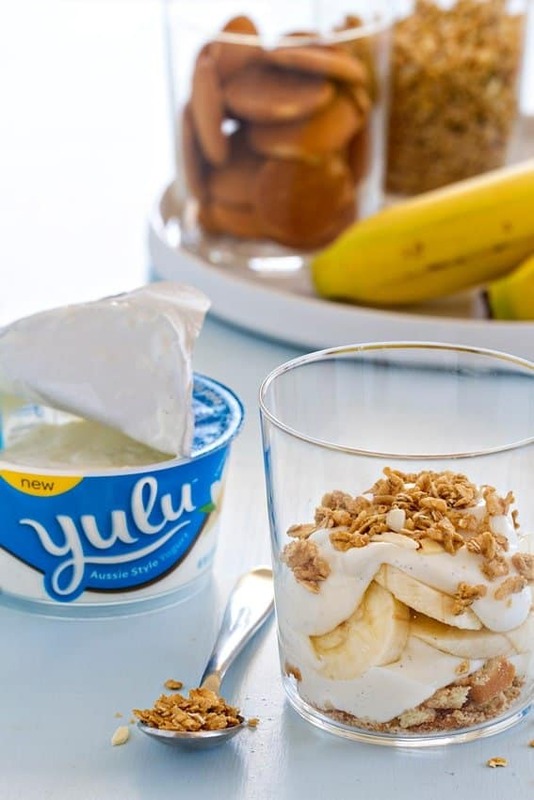 Pair that with some fresh bananas, and crunchy, nutty granola (and a few vanilla wafer cookies, because I’m still me), you’ve got a portable, adorable, completely delicious breakfast at your fingertips. You can even make them ahead of time to get that truly luscious banana pudding texture we all know and love, with the wafer cookies and granola going soft and squidgy. I like to sprinkle a few more crushed wafer cookies on top just before serving for a little added crunch, but that’s completely optional. 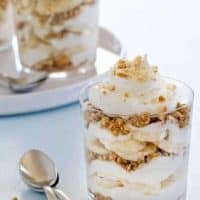 If you’re attending any Memorial Day potlucks or barbecues, these parfaits could easily double as a healthier-for-you dessert option. And since they’re easy to transport if you make them in little mason jars, all you have to do is open the lids and pop a spoon in each one. They’ll be gone in no time. Add 2 crushed vanilla wafers into the bottom of a cup or small jar. 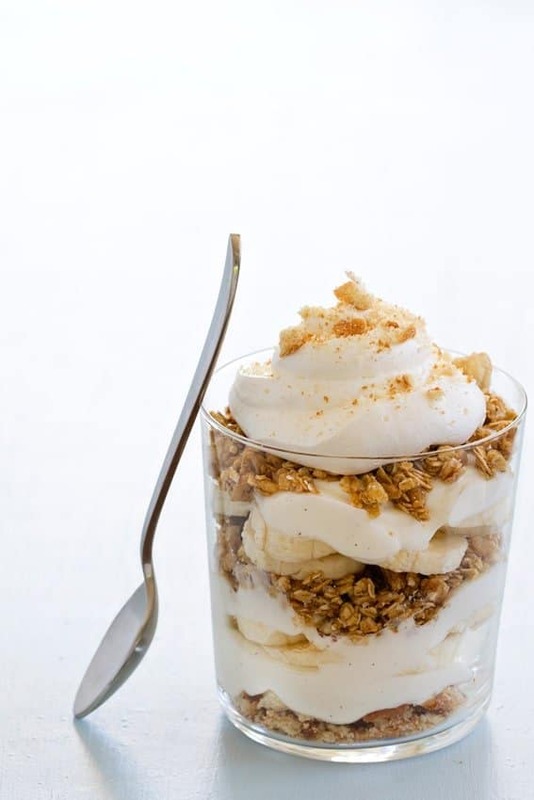 Spoon half of the yogurt onto the crushed vanilla wafers followed by the granola and a layer of banana slices. Repeat the process. If desired, top with whipped cream and crushed vanilla wafers. Love the idea of pudding for breakfast! Yum! I hope you get the chance to try them. Thanks for visiting! I love this idea so much! I love turning any dessert into a breakfast! What better way to start the day… And you photography is sop pretty in these pics! Hi, Whitni! Thank you so much for your compliments! You made my day!